From the very early years of our foundress Mary Ward’s life, love for Jesus and trust in Mother Mary formed the foundation of her Spiritual life. 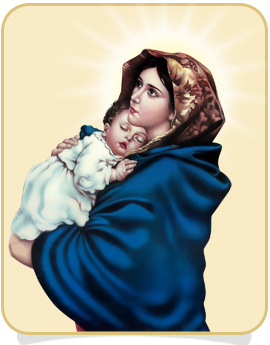 Her devotion to Mother Mary was so great and tenderly dear that she urged her sisters to choose her as their special patroness; love and reverence her with all their strength and fly to her with filial confidence in all their necessities. She desired that our devotion to mother Mary should be the badge and uniform of our Institute. Hence, from the time of Mary Ward, the Congregation of Jesus and all its members have been distinguished by a particular reverence for Mary, the Mother Jesus. A new beginning was created in the history of human kind when Mary was born. In God’s gracious plan she was born to Joachim and Anne in their advancing years. God chose her from the first moment of her existence in the womb of her mother Anne and filled her with the gifts needed to fulfill her special role as the mother of God. Undoubtedly, the most glorious girl child to grace this planet as “our tainted nature’s solitary boast” was Mary, the mother of Jesus. Thus Mary’s birth was a momentous event in the salvation history of mankind; and in her life we see the magnificent design of God’s plan for the human race unfolding gracefully. The beautiful harmony of Mary’s nature made her a model of being receptive to God’s Word; being prompt in saying ‘yes’ to God’s will and in being sensitive, caring and other oriented. Because of her tremendous faith and trust in God she had a praise-filled and joyful attitude towards all events of her life. With deep faith and trust in God Mary stood by Jesus from the crib to the cross on Calvary. From her life of faith and prayer we can learn how to listen to God’s word that it may bear fruit in our lives. God entrusts his riches, his wisdom, his mysteries and his miracles only to the faithful hearers of His Word. Mary heard the word of God, kept it faithfully in her heart, pondering over it with single-minded concentration and continued unwavering in the long and hard way ahead of her. Yet in the eyes of the world Mary did not accomplish great things. She was like any other house wife engaged in chores of her day to-day life. But she lived her ordinary life in the spirit of her ‘fiat’ making it extraordinary. For Mary nothing was too small or too little; everything was important and had to be attended with equal devotion and attention. Mary was perfected through her faithfulness in little things and her glory consisted in the positive option she made for building up God’s kingdom of love, justice and peace in our world. so full of love and humility. That I may be able to love Jesus as you loved Him. May mother Mary the empowered woman of vision and spiritual stamina’ forever remain our Mother and Companion along the road of life.